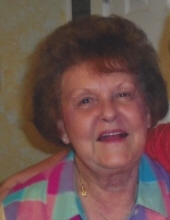 Carol Sue Featherstone, 79, of Arlington, passed away on Friday, February 8, 2019 at Morningside Assisted Living of Mayfield. She was born on June 20, 1939 to the late Girt and Alta Tucker Frizzell. She was a long time member of Arlington First Baptist Church. She worked over 30 years at Deena Lamp Factory and retired after 25 years at Harpers Ham in Clinton. She loved her Sunday School class and church. She enjoyed spending time with her family and friends. She is survived by her daughter, Donna Terry and husband, Randall, of Cunningham; her granddaughter, Amber Crittendon and husband Alan of Fancy Farm; grandson, Adam Terry and wife Heather of Mayfield; three sisters, Linda Jo Floyd of Hammond, Indiana, Hilda Gay McGee of Columbus, Mary Ann Getz of Mayfield; one brother, Michael Frizzell of Clinton; six great-grandchildren, Blake Crittendon, Cody Terry, Brianna Terry, Aaron Crittendon, Evan Terry and Reagan Crittendon. She was preceded in death by her husband, Kenneth Featherstone, her parents and sister, Martha Jane Dennis. Funeral services will be held on Tuesday, February 12, 2019 at 2:00 p.m. at Milner & Orr Funeral Home of Arlington with Rev. David Sphinx and Rev. Terry Norris officiating. Burial will follow the service at Springhill cemetery. Visitation will be held on Tuesday, February 12, 2019 from 11:00 a.m. until 2:00 p.m. at Milner & Orr Funeral Home of Arlington. Expressions of sympathy may take the form of donations to: Arlington First Baptist Church Building Fund. 129 KY-80, Arlington, KY 42021. To send flowers or a remembrance gift to the family of Carol Sue Featherstone, please visit our Tribute Store. "Email Address" would like to share the life celebration of Carol Sue Featherstone. Click on the "link" to go to share a favorite memory or leave a condolence message for the family.